Cal Poly’s Horticulture and Crop Science department is well-known for preparing the next generation of industry leaders. Our students don’t just sit in a classroom. They work outside in our fields and gardens and inside our labs. They find solutions to real-world problems. And they discover a broader spectrum of career possibilities than ever imagined. Our on-campus facilities include fields, groves, vineyards, nurseries, orchards, an arboretum and gardens, and greenhouses. Students experience real world applications through internships and other collaborations with our industry partners. They also develop a foundational plant science background. Our graduates go on to be business owners, growers, researchers, educators, salespeople, landscape contractors, designers, consultants, pest control advisors, park and golf course superintendents and public garden professionals. 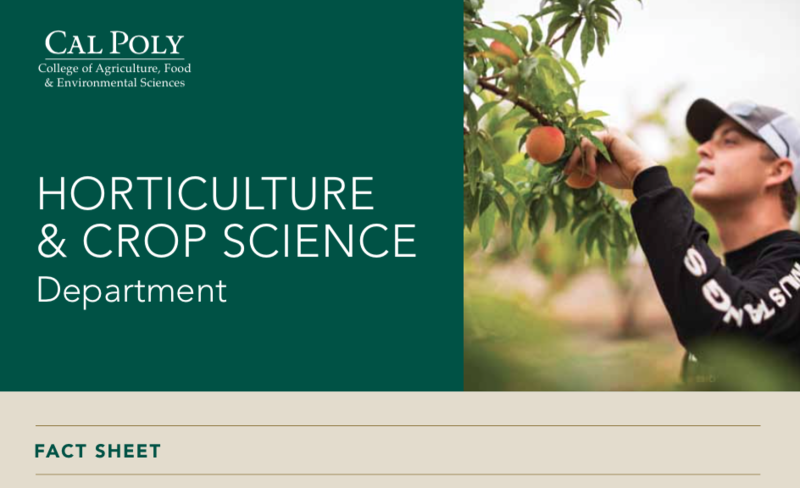 We invite you to explore the many possibilities of Cal Poly’s Horticulture and Crop Science department. Everything is very hands-on. You don’t just learn the theory behind propagation. You actually get to do it.